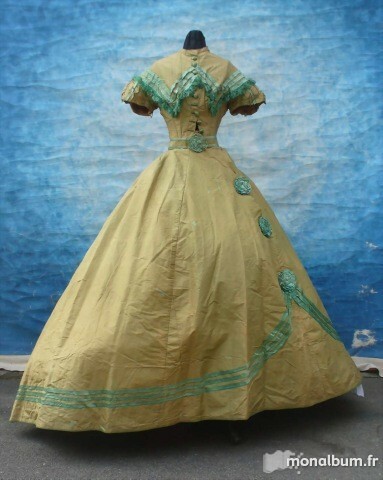 This is one of those spectacular finds that a fashion collector dreams of discovering. 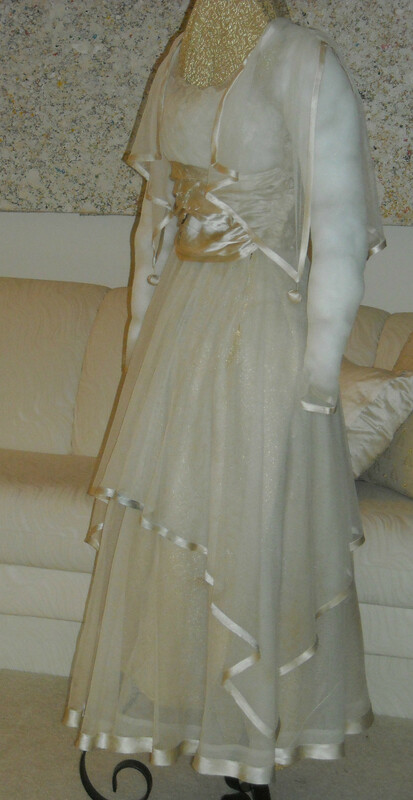 This dress is so very exquistite and is in remarkable condition. It is strong and beautiful with no holes and is nearly free of stains too. The dress also smells just fine! For a dress of this age- I am thinking turn of the century- 1895 to 1910. It is in unbelievable condition. 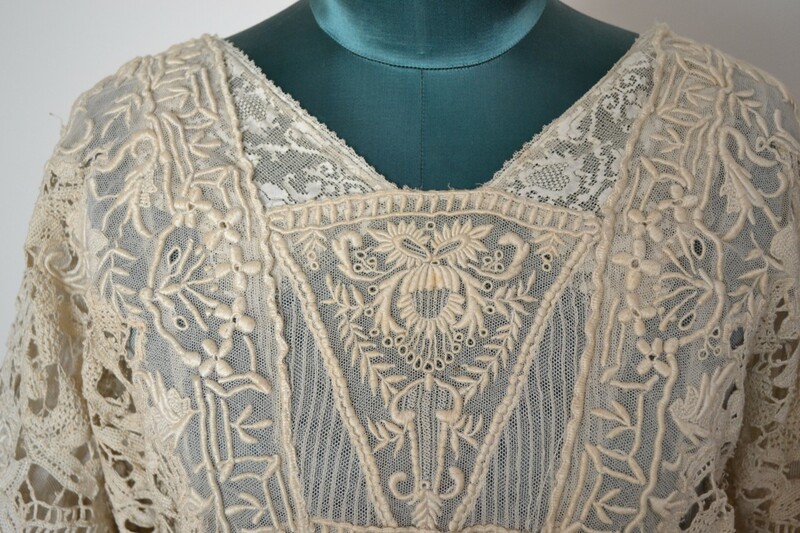 The lace work is fabulous. 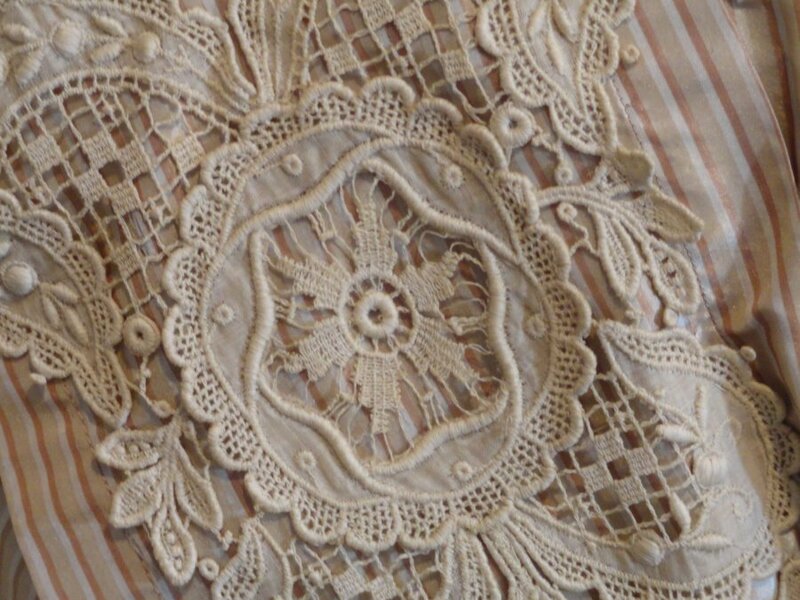 I am not certain of the precise terminology but it resembles what I have seen called these types- Irish crochet, embroidered, padded, battenburg, gros point de venise, point de gaze, point d' france. 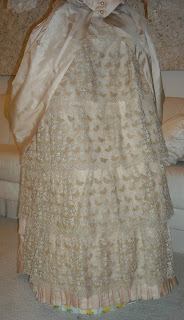 I have compared this to many other examples and these names are what I felt are the closet to this dress's lace work. 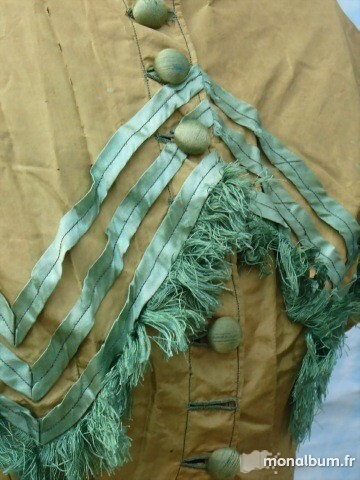 There is a combination of hooks, buttons, and snaps as closures. 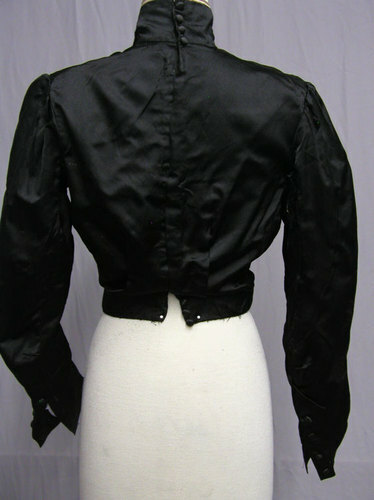 The back has a blousen effect and is stitched permantly in that way. The size is probably best on a small to medium but I have provided approximate measurements below and those should be used to determine if you think this will work for your needs. There are a few small spots here and there but nothing significant. The inside band at the waist is fragile and you may want to stitch it, remove it, or replace it. It does not affect the lace. Any other issues would be even more insiginificant. It is not often that something this great comes along and in this condition. You could spend many thousands of dollars on a new wedding dress that would not come close to the special quality of this dress. 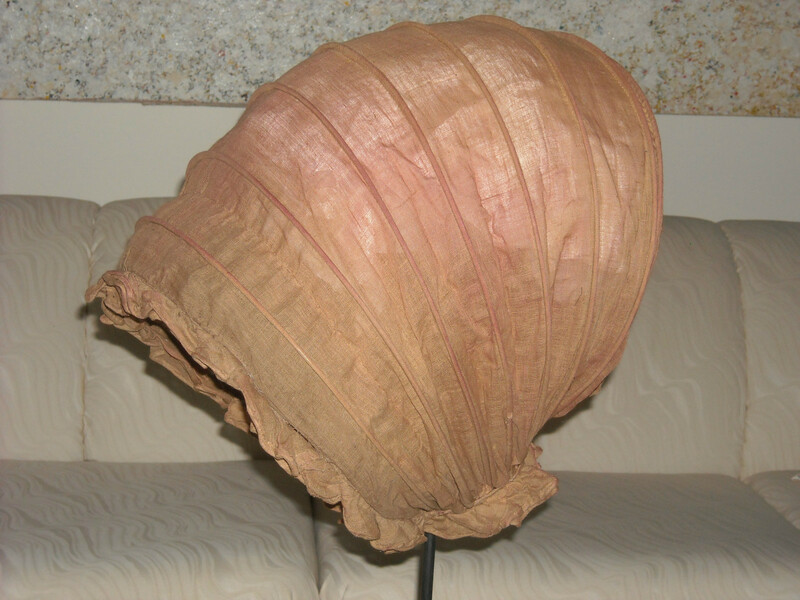 This is an investment piece- something that was painstakinly crafted from a nearly lost if not lost art. It is a treasure for certain. Thanks for your consideration. 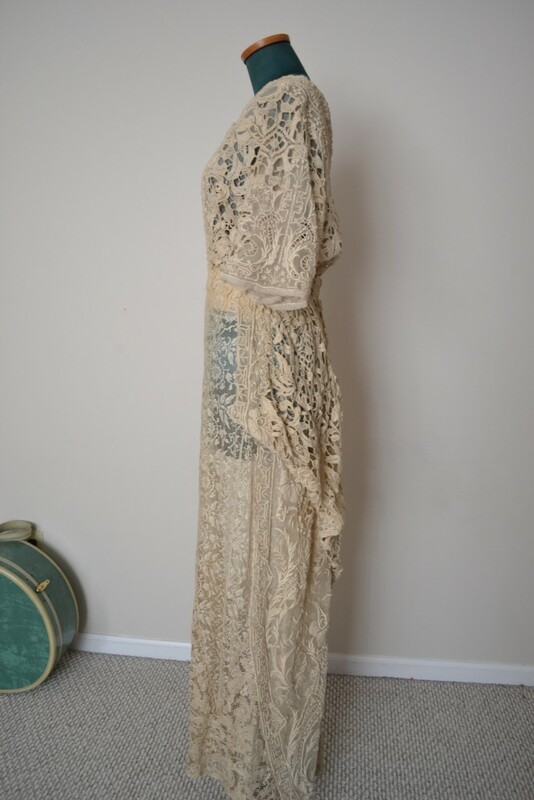 Bust of the exterior lace dress- it has what should be loose armpit and bodice area so keeping that in mind I get about 40" to 46" maximum bust but you should use the sizing of the inner layer. 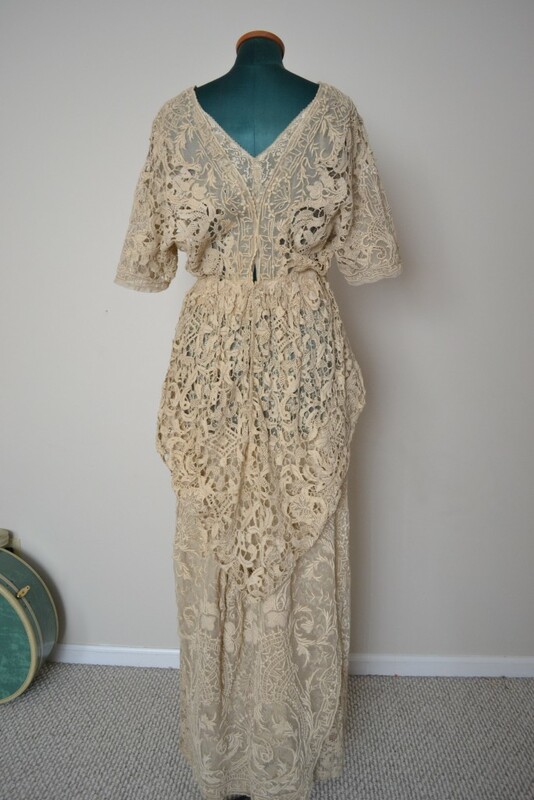 I have many beautiful designer and vintage fashions currently at auction and will be happy to combine shipping on multiple wins. I OFFER PRIMARILY FINE DESIGNER HIGH END FASHIONS AND RARE VINTAGE CLOTHING FOR YOUR CONSIDERATION. 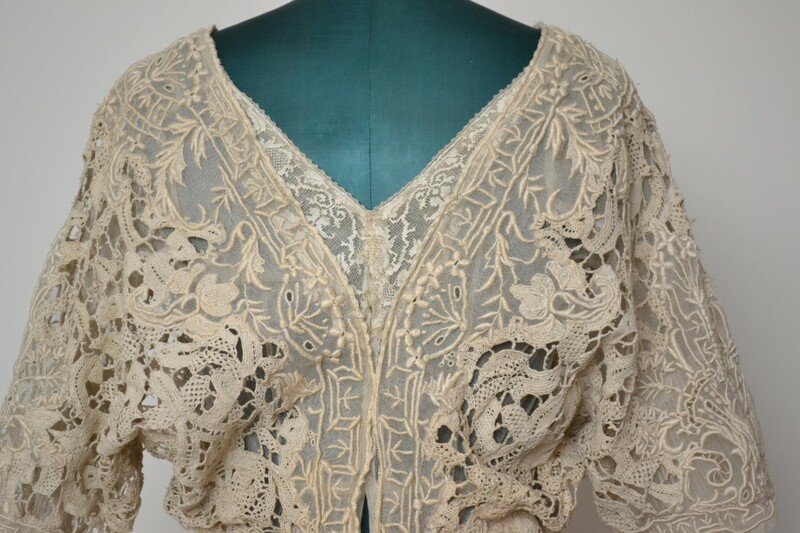 SUCH COLLECTIONS ARE DIFFICULT FOR ME TO FIND AND CERTAINLY A TREASURE FOR YOU TO OWN SO IF YOU LIKE WHAT YOU SEE PUT IN YOUR BEST BID EARLY BECAUSE WHEN IT IS GONE IT JUST MAY BE GONE FOREVER. 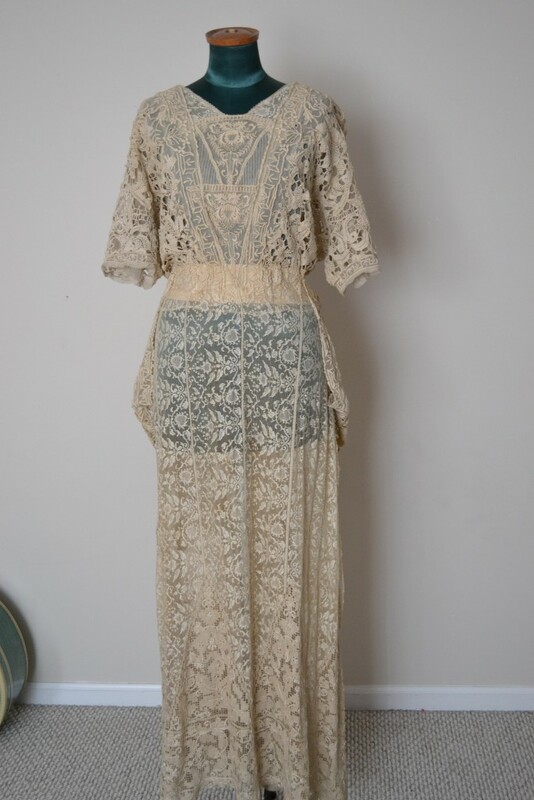 So, most likely from around 1912 given the shape and waistline and in a wearable size! 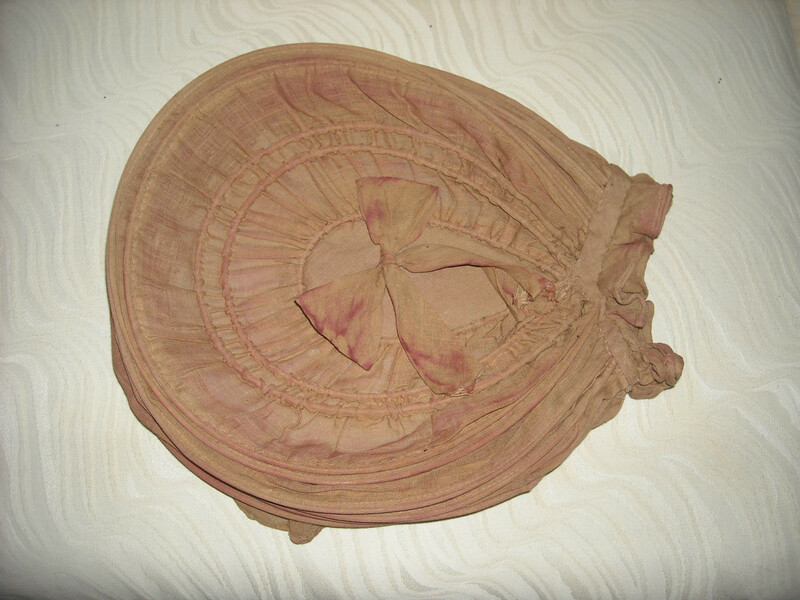 This is a rare huge 18th century calash bonnet in a tan guaze like fabric and has a small bow on the back. 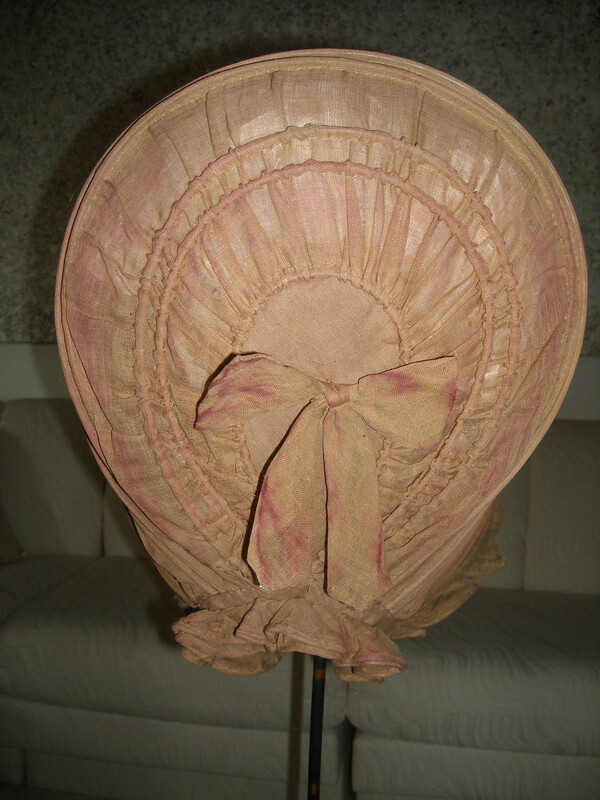 It is hand sewn and seems to have been a reddish color at one time. 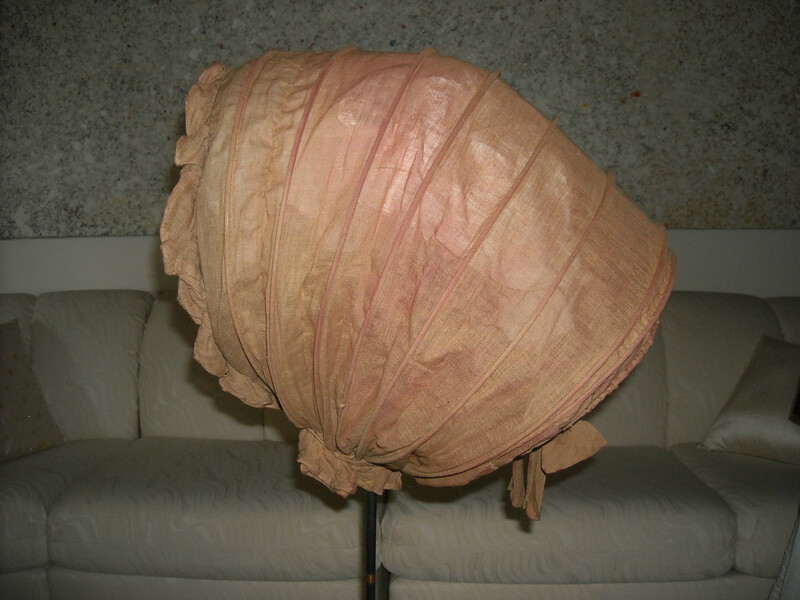 The frame is reed and the body of the hat is in good condition - some of the seams along the back and bottom have seperation and mens (photos). The bonnet is missing it's ties. 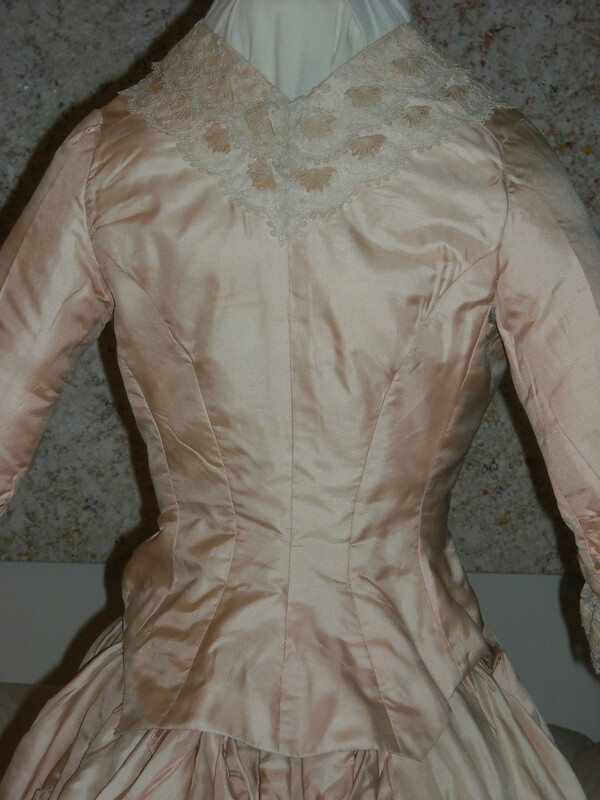 The overall shape suggest Regency rather than Rococo. It's very long compared to being fairly shallow but high. 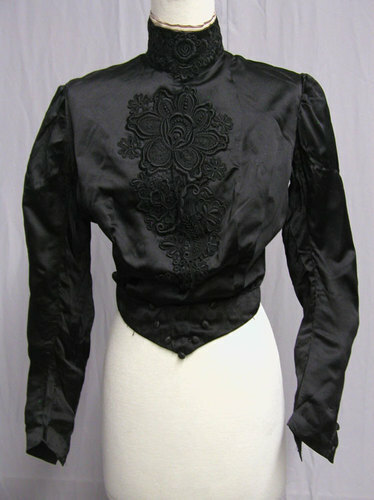 1890's Floral Appliqué Bodice: This black silk bodice from the 1890's has a large floral appliqué on the front. The waist is 24 and the bust is 33. There is some underarm wear and the right arm has some splitting that could be stabilized if you wanted to wear it. There is a 3 inch tear and a 2 inch tear right by the back seam of the same sleeve. 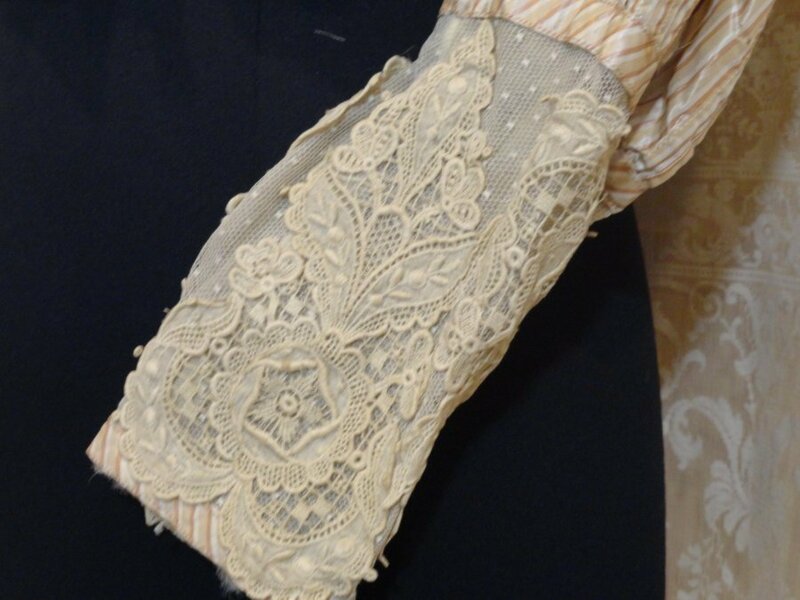 If nothing else the lace appliqué’s would be great to use on other projects. The bidding will start at .99 with no reserve.. 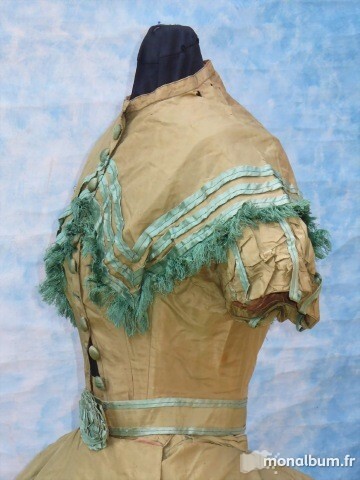 Although I can see why the seller thinks this might be 1890's, I think this is very early 1900's. 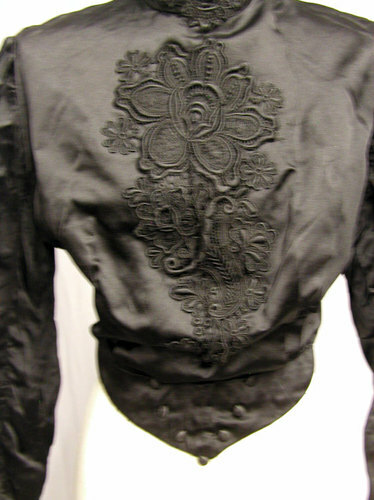 The blouse itself looks rather plain at first but look at that waist detail! 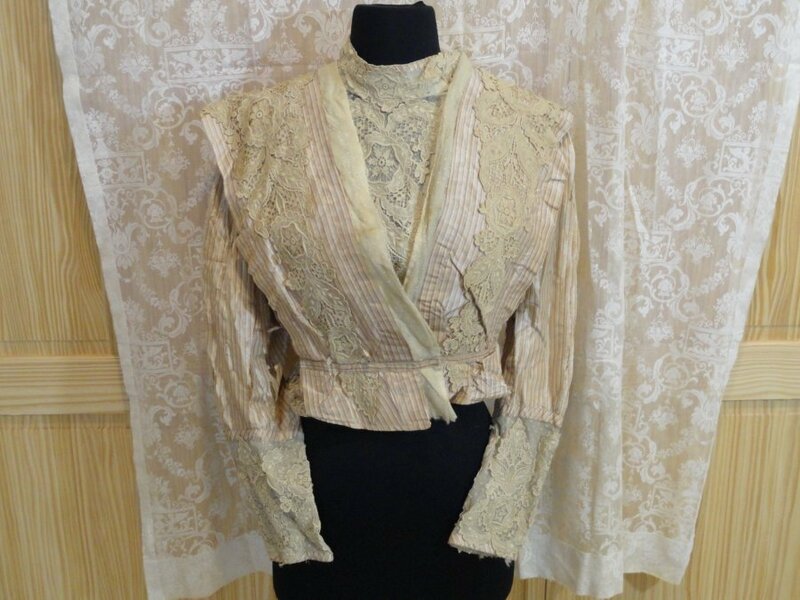 This is a Lovely Edwardian Antique Ladies Victorian Point de Venice Lace Jacket with lovely collar. Found at an estate sale. 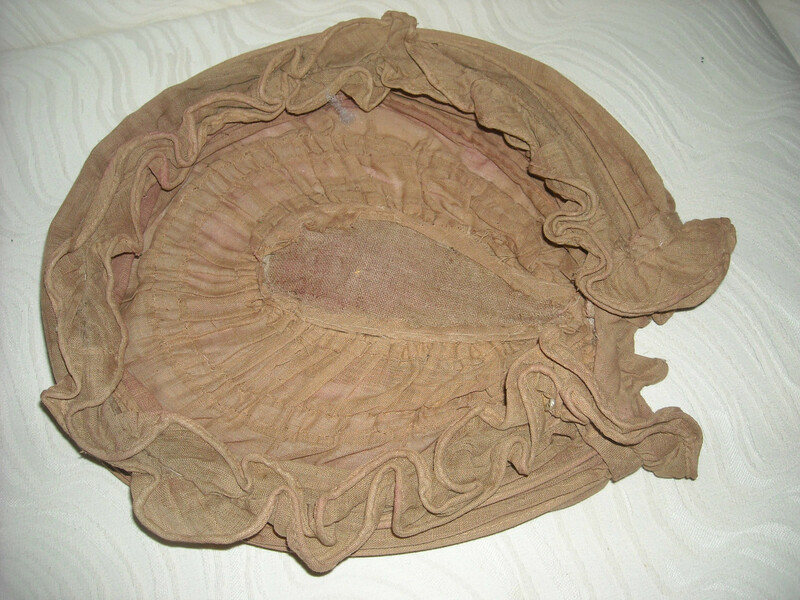 Something worn form the Titanic era. Has metal clasps and hooks inside. Several tears to the fabric. 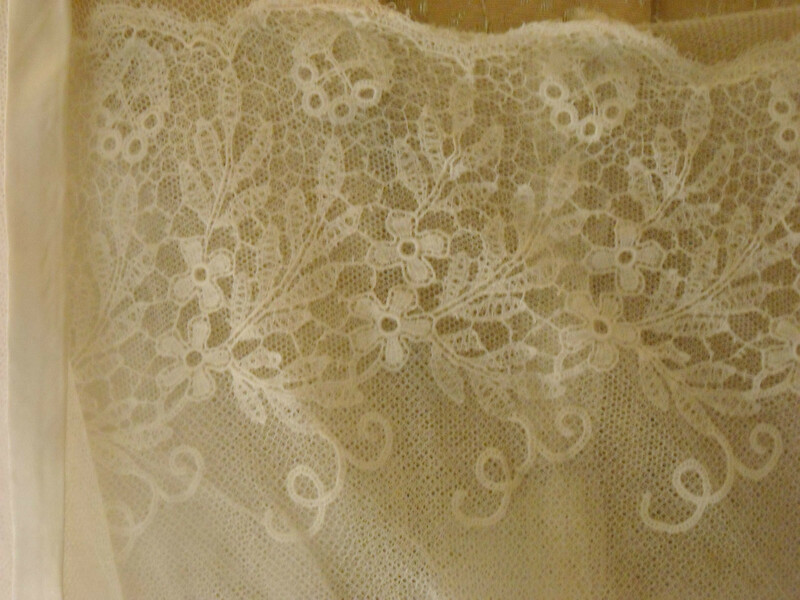 Lace is in nice shape. 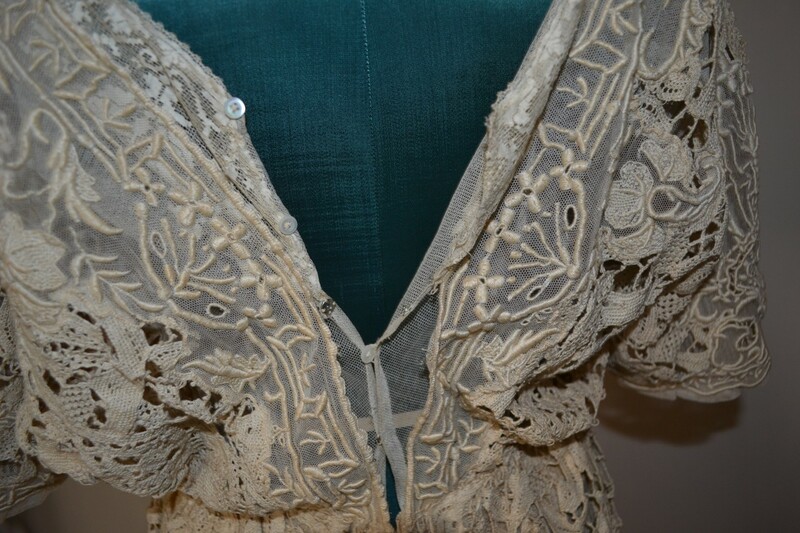 Measurements of the jacket are from armpit across the chest are are 23" inches, about 19" in length from top to bottom in the front, and 20" from top to bottom on the backside, each sleeve is about 22" inches in length, and shoulder to shoulder is about 17" inches. The Collar measures about 15" around. It's in nice shape, has some wear from age. Delicate for wearing. Nice find for this era~~ Would look great in a boutique or a a display in your home or store. Can even use as a costume. Please feel free to e-mail me with any questions!!! Will combine shipping with my other items. 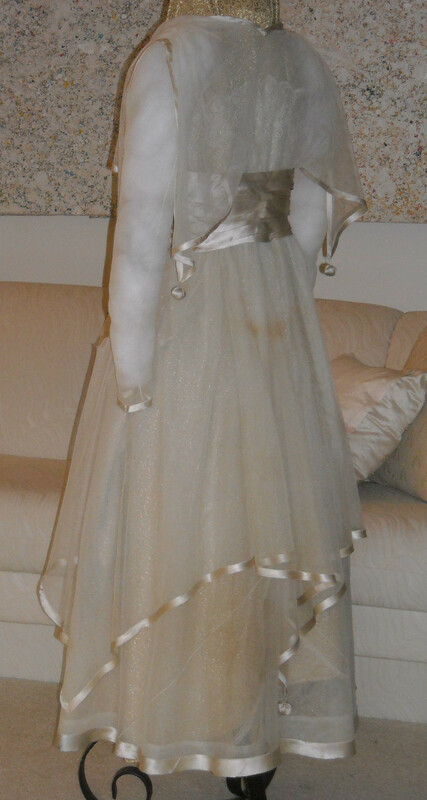 The photos do not do justice to this amazing dress!. 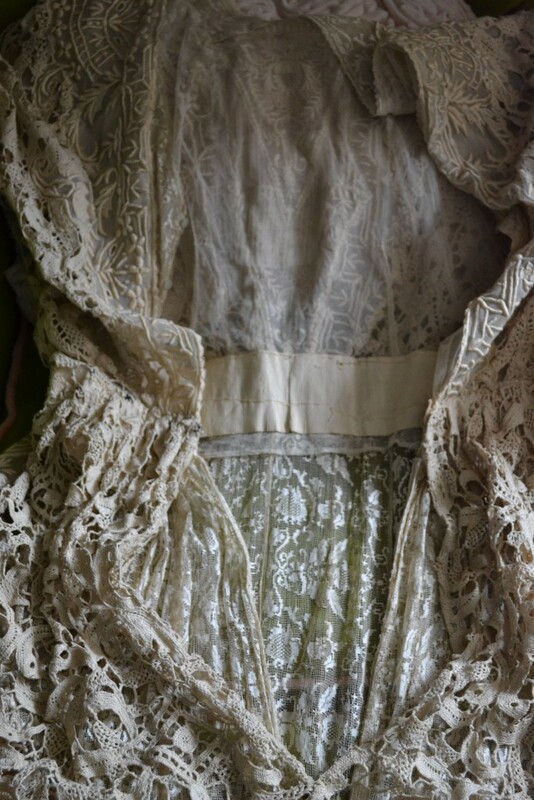 This is an exceptional example of a late Edwardian dress, 1915 - 1916, in an ivory net with silk ribbon trim. 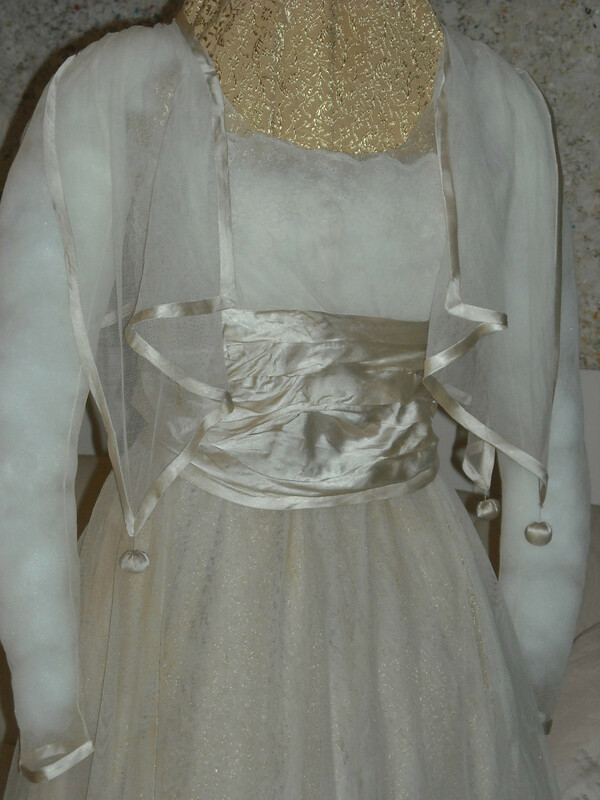 I have the dress stuffed with fiberfill and a gold cloth under it so that you can see some of the details - the last two photos I took out the stuffing and the gold cloth. 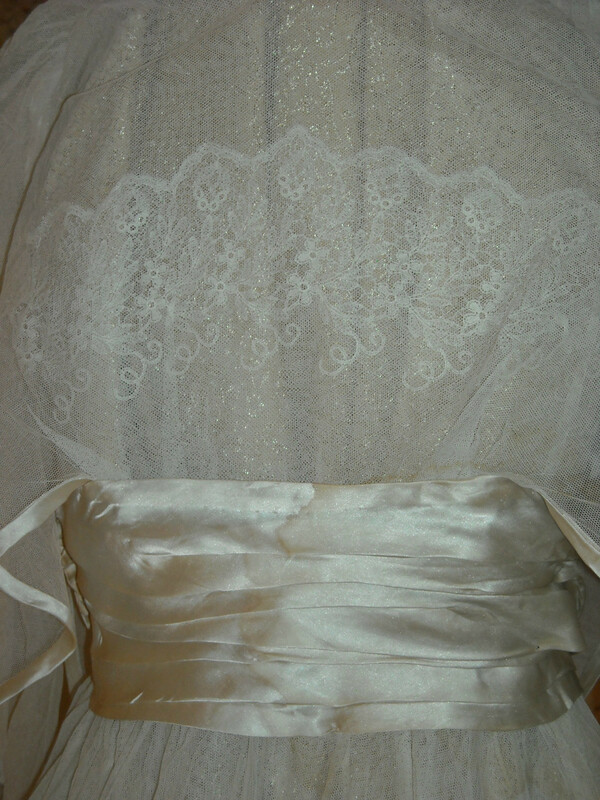 The top has lace and netting with the net done in draped points edged in the silk ribbon. It is also decorated with little silk balls and a wide silk band around the waist. 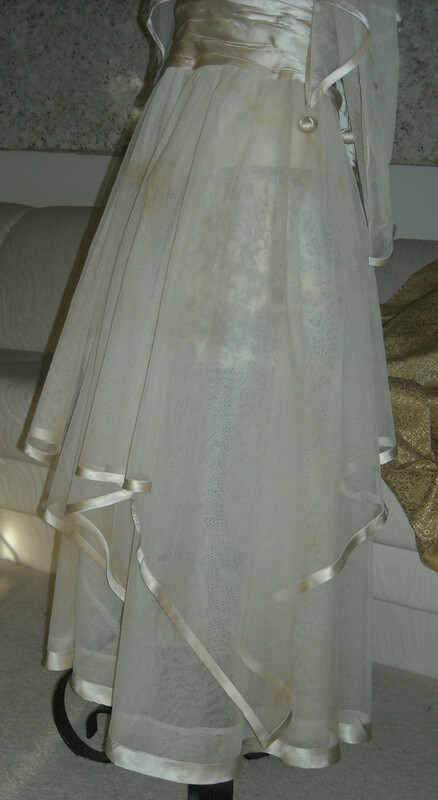 The bottom of the dress is sheer with layers of the net edged in silk ribbon and a silk ball in the back. The top layer of net is done in the points. It fastens with tiny snaps, hooks, and loops. There are some stains (photos) and a few tiny pin holes in the netting. The netting is not dry and the silk is not shattered. 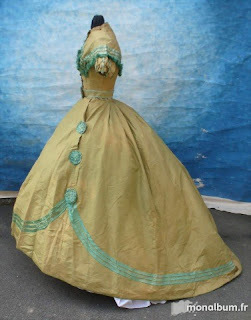 This great Victorian dress most likely dates from the mid to late 1860's. 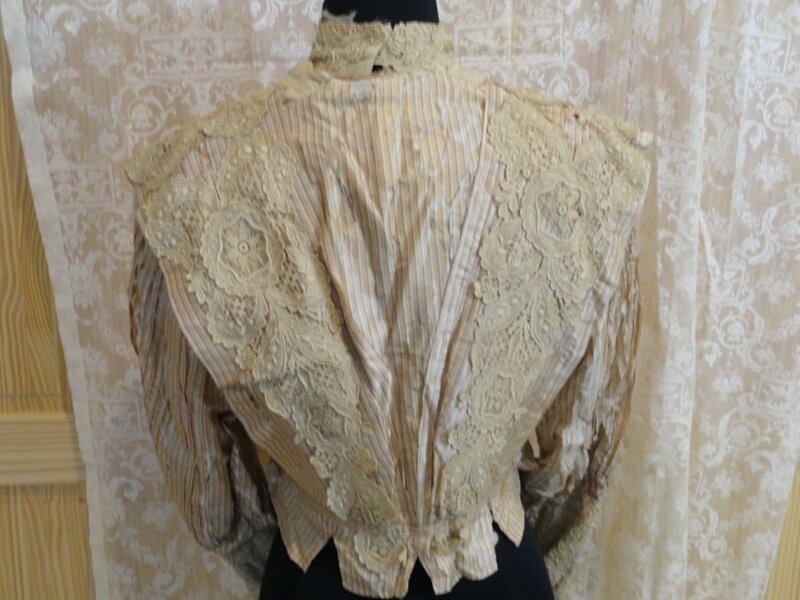 It could date from the Civil War era judging by the dropped shoulders on the bodice with short sleeves and the slightly tear drop shape of the skirt. 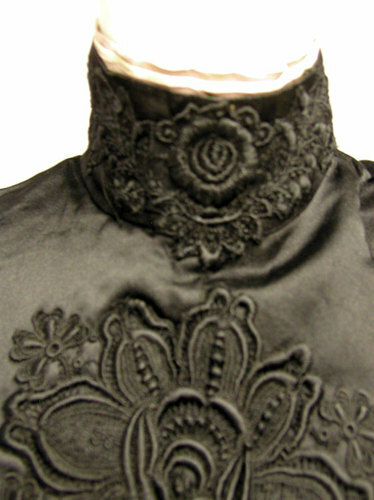 The bodice with short sleeves has 8 stays: one in the center of the back, one on each side, and 5 across the front. 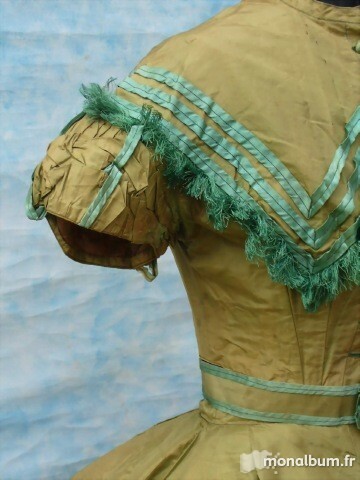 The bodice with shoulder straps has 7 stays: one on each side and 5 across the middle of the back. 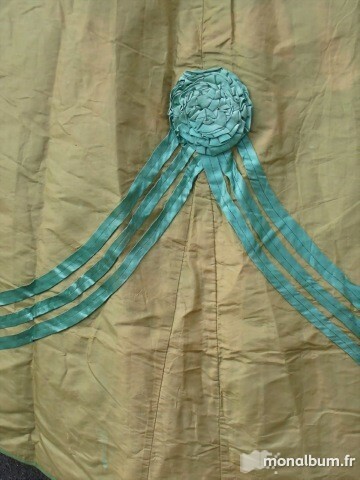 The skirt has a pocket on the right side, and it also has a little watch pocket on the left side at the waist. 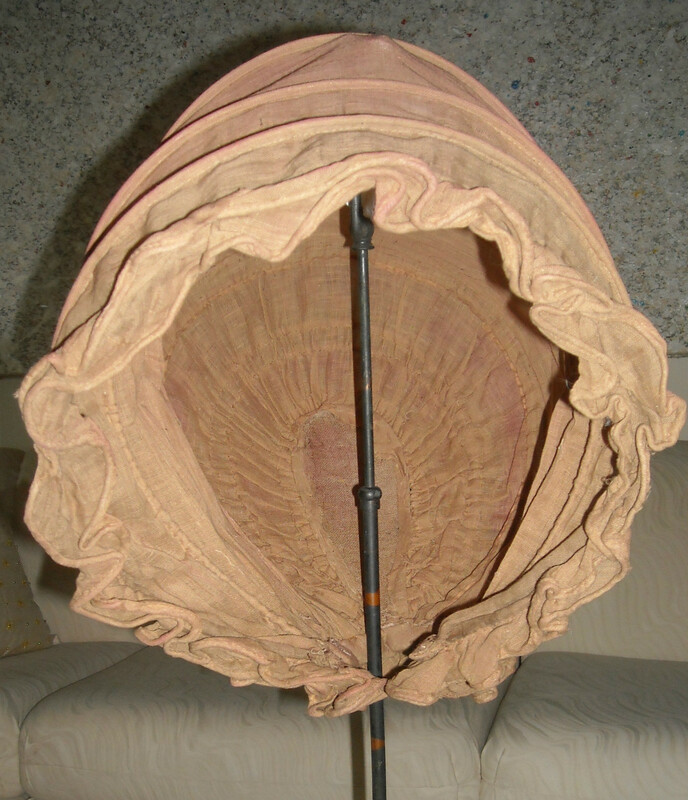 On the underside of the skirt there is an 8" wide band of stiffened muslin all around the circumference of the hem. 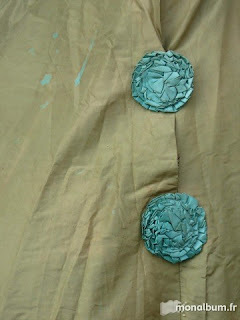 The skirt is also lined with a brown glazed cotton. As you can see in the photos, there are tears in the seam between waistband and the material on the skirt. 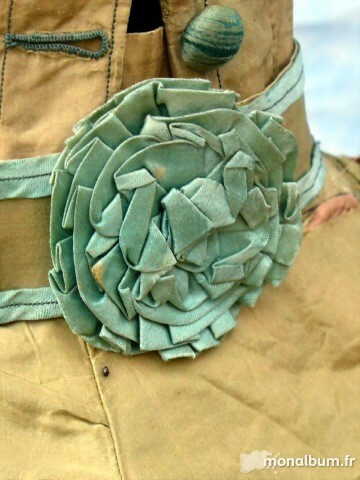 They are both situated under the fasteners on each side of the opening in the skirt. There are more of the greenish water stains along the edge of the hem. There are apprx. 3 to 4 dozen spots spread the circumference of the hem that range in size from 1/8" to 4" in size. 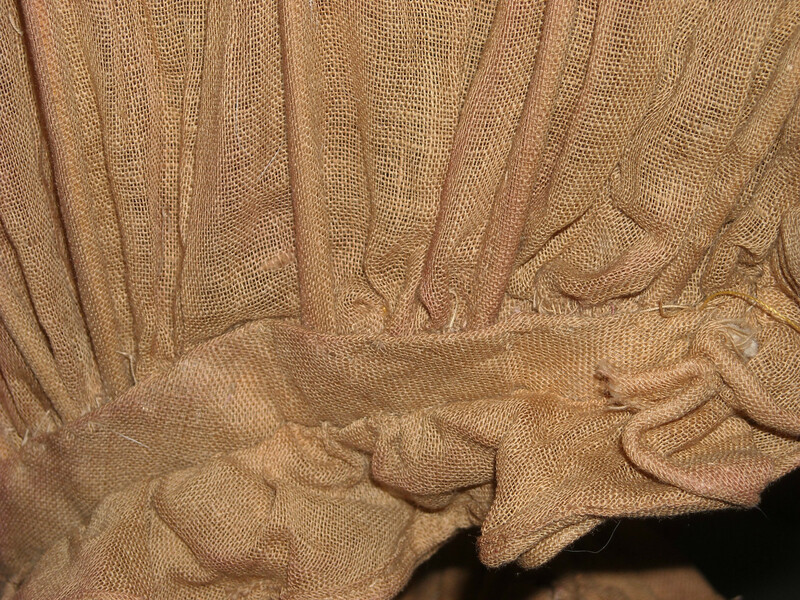 There are two other large areas of damage on the back of the skirt at the hem. The first is a brown stain that is about 13" long with varying heights between 4" to 1". Next to this brown stain is a 6" by 4" area with 8 to 10 holes that range in size from a pinhole to 1/2". There is a 2" long horizontal split in the middle of the right side of the skirt. As you can see in the photos, there are water stains 5/8" and 3/8" in size. The hooks and eyes both have rust on them. There are dark rust stains on the lining next to the eyes. I'm not sure what they are, but there are several dozen pinsized black spots on the lining in the middle of the back. They do not show through to the silk fabric. As you can see in the photo of the bodice, a 3" section of the green fringe appears to be missing on the front. 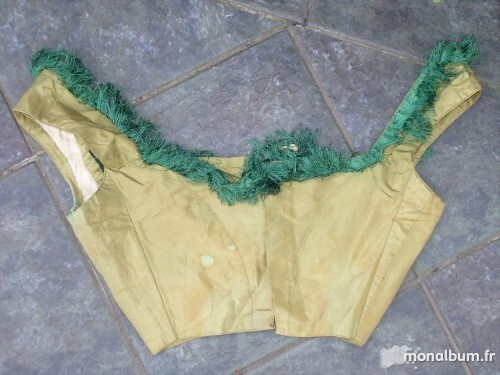 It is actually hanging loose on the inside of the bodice. There don't appear to be any perspiration stains in the armpits. It has deep armpit stains. The left armpit has 3 to 4 1/4" long splits in it. The buttons are just showing some shattering, but they are still intact. 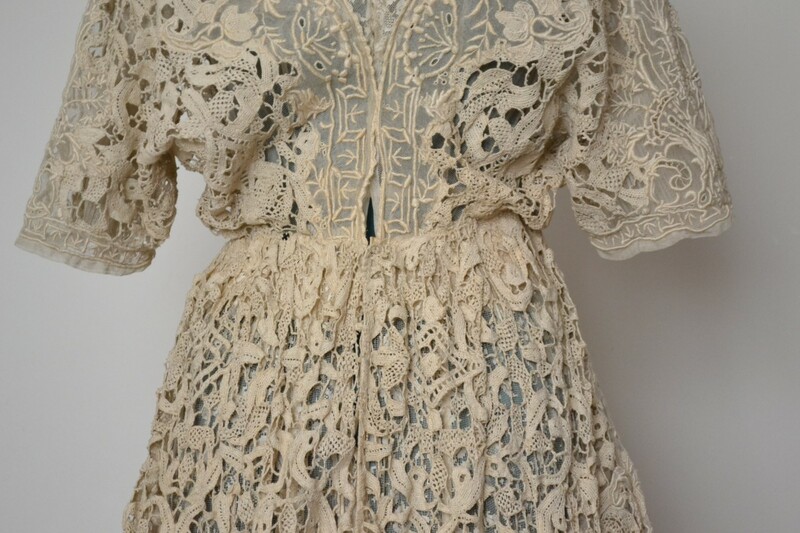 On the front of the bodice at the edge of the waist, there are tiny little holes where the points of the stays are starting to poke through. On the right shoulder next to the neck, there is a 1 1/4" long split or hole. The material just below the neckline is also starting to shatter. All of the holes and shattering go through the brown lining. 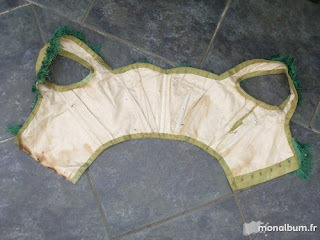 There is a 4" long split in the brown lining on the right side of the bodice. Belt It is in very good shape. There aren't any noticeable stains or shattering. Although this dress does appear to have a lot of damage, most of it is situated in high stress areas such as the armpits, waist, and hem. 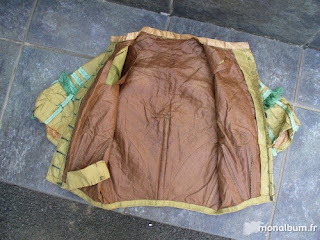 The body of the fabric is actually stable and in fairly good condition. The dress doesn't have a standard size so I have taken some measurements to help determine a proper fit. Skirt: The waist measures 20". The length of the front of the skirt is 39". 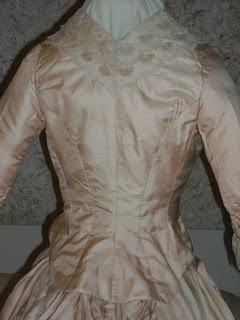 The length of the back of the skirt is 54"
Bodice with Short Sleeves: The flat bust measurement is 14". The waist is 18". 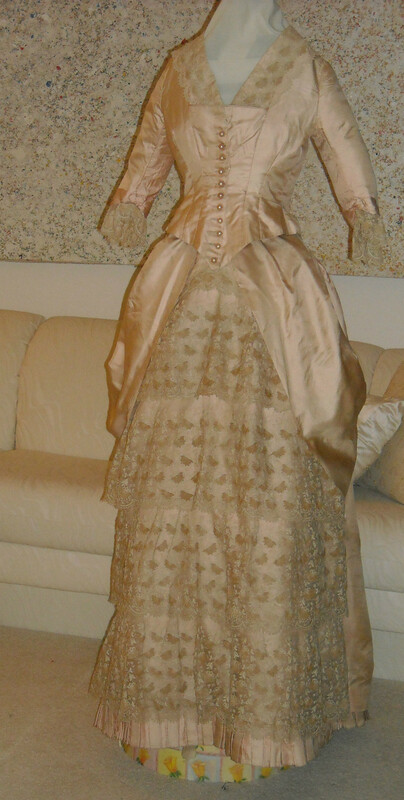 The length of the front from the neckline to the waist is 15". Bodice with Shoulder Straps: The flat bust measurement is 15". The waist is 18". The length from the top of the shoulder strap to the waist is 13". Scarlett O'Hara? Eat your heart out. 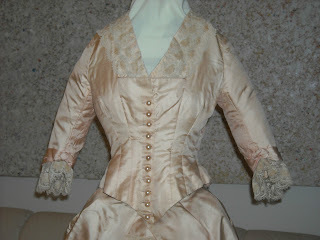 This is a magnificent Victorian fancy bustle dress from the 1880s in a peachy pink silk (blend?) 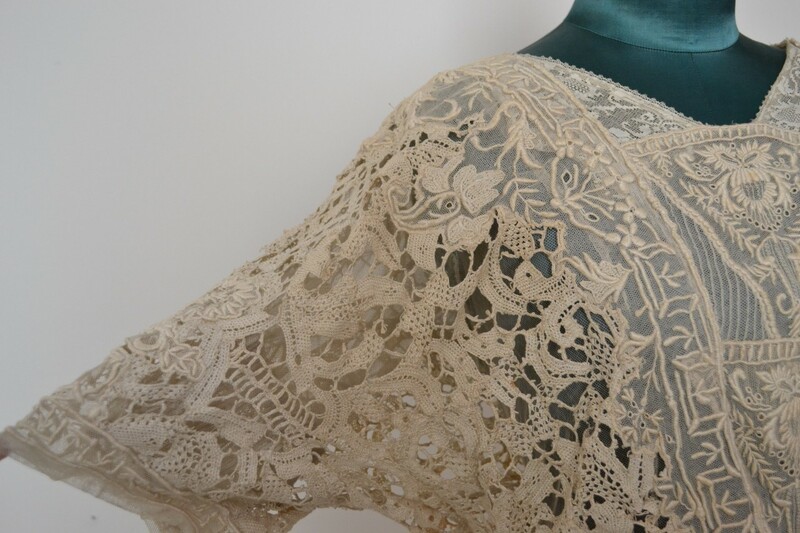 trimmed in the most gorgeous lace! 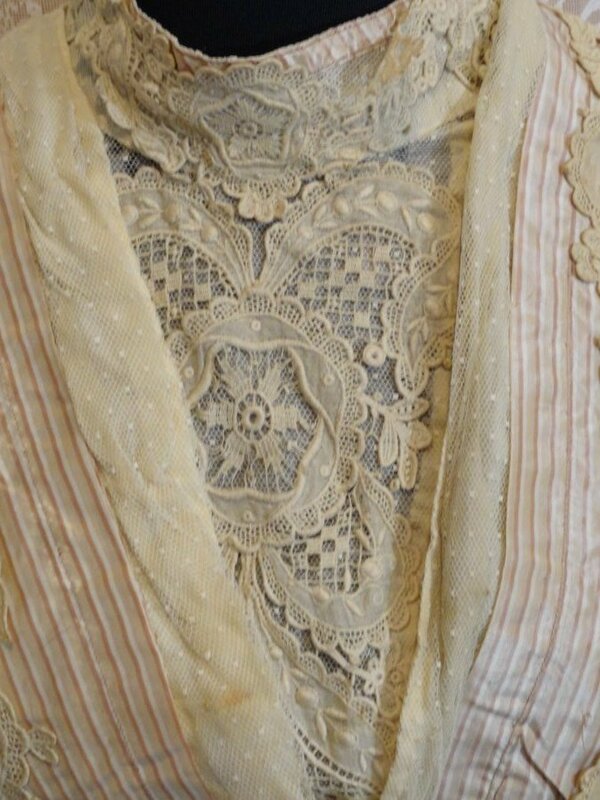 The bodice is trimmed with the lace around the neckline and cuffs. It is lined in cotton and fastens up the front in matching buttons. 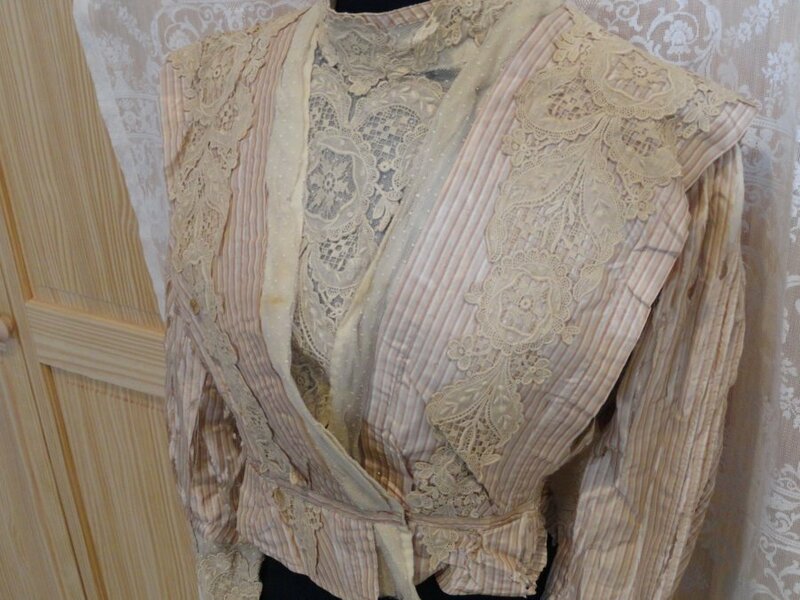 I was not sure if the buttons were original to the dress but I was told by a button collector that they are glass and are probably the originals. 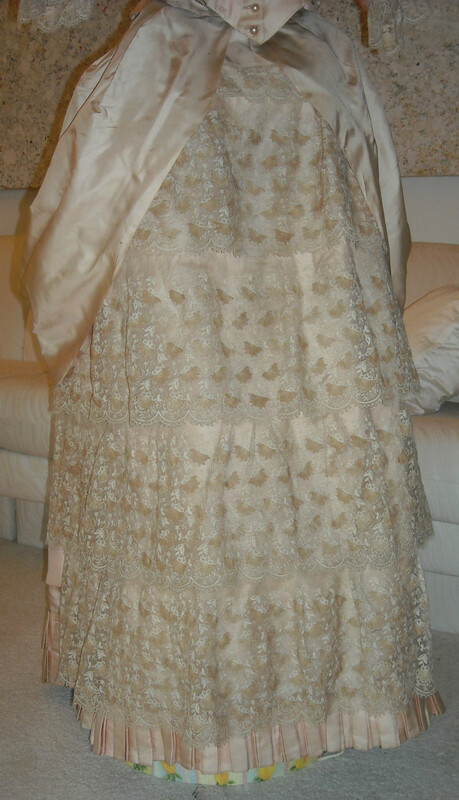 The skirt has four rows of beautiful lace and one small row at the top. 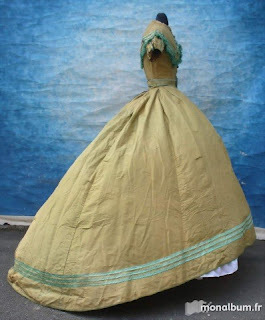 The skirt also has a built in bustle. It is lined in a stiff material. The condition is very good with just some minor damages. There is a slight underarm stain, a missing eye at the top of the buttons on the bodice and a hook on the waist ties that hold up the back of the bustle, a couple of tiny pin holes, and the worst is the waistband on the skirt where the hooks and eyes are needs reinforcement due to a tear and wear. Given the colonial styling, my guess this is from right around 1876 when the colonial styles were popular again - with their own Victorian touches, of course!